Tickets are now available for three days of literature, music and celebration to mark the centenary of Anthony Burgess’s birth. 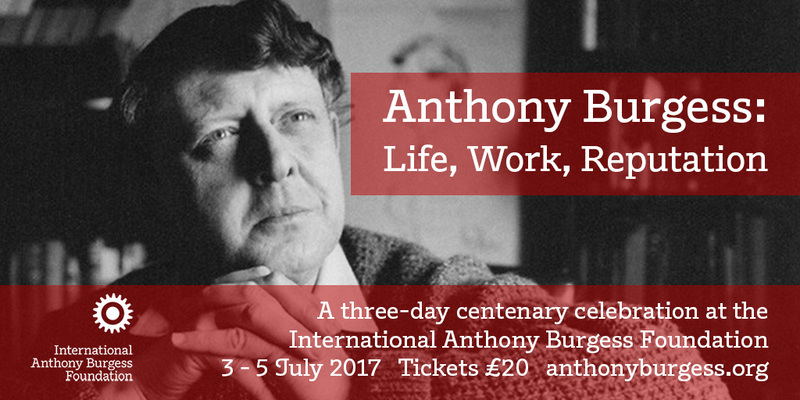 Anthony Burgess: Life, Work, Reputation (3-5 July 2017) takes place at the International Anthony Burgess Foundation in Manchester and will feature discussion by some of the leading Burgess experts on subjects such as Burgess’s early life in Manchester, his war years in Gibraltar and his novels from his first published, The Malayan Trilogy, to his writing about Shakespeare and new takes on his dystopian science fiction. There will also be a chance to hear live performances of Burgess’s music and to tour the place from Burgess’s youth in Manchester, including Xaverian College and the University of Manchester. Tickets for this event are only £20 for the three days. This includes freshly made buffet-style lunches, teas and coffees, and wine receptions. For a full programme and to buy tickets click here. On Sunday 2 July, the first volumes of The Irwell Edition of the Work of Anthony Burgess will be launched at a wine reception at the Burgess Foundation. The Irwell Edition will bring all of Burgess’s novels into print in special editions with new introductions, notes on the texts and extra materials. Meet the editors of A Vision of Battlements and The Pianoplayers, buy your own copies of the books, and hear about the future of the project from Manchester University Press. On Monday 3 July, there will be a tour of Burgess’s former school Xaverian College. This will be followed by a curator’s tour of the new Burgess exhibition at the Whitworth Art Gallery and a reception at the University of Manchester. On Tuesday 4 July, at the Bridgewater Hall, there will be a performance of Raymond Yiu’s new song cycle The World Was Once All Miracle, inspired by the poetry of Anthony Burgess. This will be performed by the BBC Philharmonic alongside the European Premiere of Burgess’s own Symphony in C. (Please note: this event is not included in the ticket price, but discounted tickets will be available). The closing event of the celebration, on Wednesday 5 July, will be a concert at the Burgess Foundation by musicians from The University of Manchester, who will perform a programme of Burgess’s chamber music. This will include the world premiere of Concerto for Flute, Strings and Piano in D Minor (1951). Come and join the conversation, and celebrate one of the foremost British writers of the twentieth century.